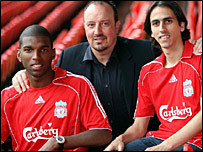 Liverpool have completed the signing of Ajax's Ryan Babel in an £11.5m deal. The 20-year-old Dutch striker has agreed a five-year contract as Liverpool boss Rafael Benitez continues a major overhaul of his squad. "I listened to them and I got a great feeling about the club," said Babel. "I have made my choice with my heart and the coach has big plans for me." Yossi Benayoun, a reported £5m signing from West Ham, was also unveiled by Liverpool on Friday. Babel admitted it was a tough decision to leave Ajax, where he made his debut aged 17 in 2004 and scored five goals in 27 Eredivisie matches last season. He said: "I have met Rafael Benitez and my conversation with him was the moment I knew the deal would get done. "He is like the ideal father-in-law. He has a lot of football know-how and he told me that I would be challenging with six other players for four positions. I have a good feeling about things. "I met Dirk Kuyt at training, who I knew from the national team. At that moment he did not feel like a rival but I suppose that is what will happen. "It was very important how the coach spoke to me, how I would fit in his team. After that conversation I knew it was the right decision." Babel was a member of the Dutch team that won the European Under-21 Championship in June and he has been capped 14 times by the full Dutch team. Liverpool manager Benitez has also signed forwards Fernando Torres and Andriy Voronin this summer.